When you join the dynamic, interactive JoyBoots List, you receive weekly free meditation videos and blogs especially for cancer survivors. Whether you are starting treatment or finished, these practices will help stabilize your mind and re-connect you to the pulse of your life. Come join me at my new site! In 2017-18, we have weekly free classes in Austin, online videos and workshops, upcoming retreat and more offerings to support your emotional recovery. In 2016, there are 2 weekly offerings for Survivors of Cancer with Kelly Inselmann! New Yoga and Talk Therapy Group for Survivors of Cancer will meet for an 8 week series beginning in February 2016. Each group begins with 45 minutes of kundalini yoga, relaxation, and meditation practice followed by an hour of group therapy. Many survivors wish they had a handbook for how to deal with fear of recurrence, self blame, stress, anxiety and depression. Relationships have usually been impacted and people often struggle with loss of identity or roles at work and home. Coming to terms with physical limitations and pain can be an ongoing challenge. Let the group help you identify what’s next in your emotional and physical recovery, even as we gasp in wonder at what we’ve been able to overcome physically and mentally. There are many paradoxes and complications in modern day survivorship and they are worth exploring! The group acts as a mirror, a sounding board for feelings and ideas, a laboratory for personal growth, and a sanctuary for connection and healing. Required: Individual Session to explore goals and determine that it is a good fit for you. In forming this group, I am offering a 50% discount for the individual session for those who schedule in January. (Usually the cost is $100). The group will be limited to 8 participants. Who? This could be a good fit for you if you are interested in learning tools from yoga and meditation and group therapy to help you process your experience. You should be in a place in treatment or after treatment where you feel like you can commit for the 8 weeks. You do not have to feel great to show up. You can come as you are – that’s what this is about. You may choose to rest during parts of the yoga – that’s ok. Like in yoga class, you will be encouraged to listen deeply to what you need. Kundalini Yoga for Cancer Survivors can be practiced by students of all levels and at any stage of their personal healing journey. Beginners welcome. All the practices can be modified for the individual’s needs. Chairs are available for those who find it difficult to sit on the floor. Taught by Kelly Inselmann, LCSW, E-RYT (500). As an 8 year survivor of stage 3 breast cancer, Kelly has a deep and personal understanding of the emotional and physical challenges experienced during and post treatment. She received her treatment at MD Anderson and has attended yoga training there. She has been teaching yoga for 14 years. Special attention is given to practices which focus on cultivating compassion for self and others while addressing lymphedema, fatigue, immune fitness, insomnia, anxiety and depression. 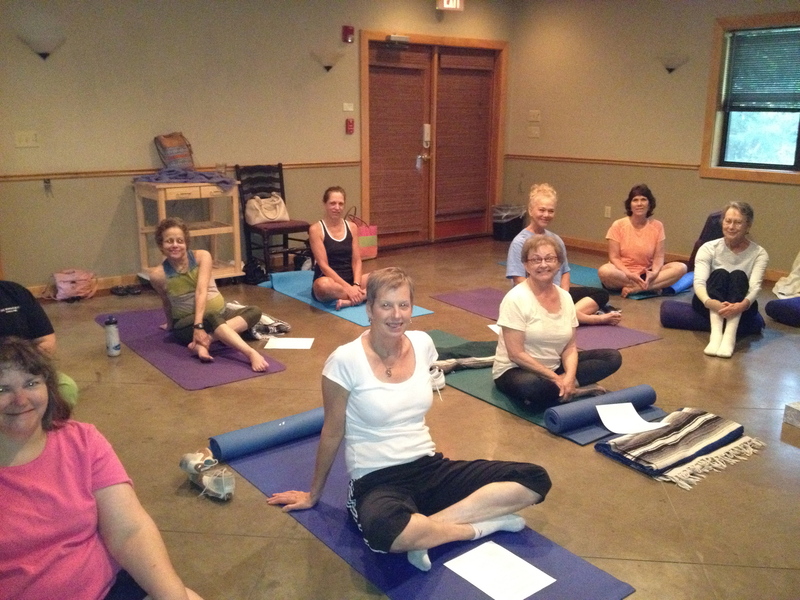 Participants have the experience of breathwork, deep relaxation and meditation in every class. road to recovery. I feel unselfconscious and comfortable within an atmosphere of hope and strength. I make this class a priority every week.